Not to be confused with combinatory logic, a topic in mathematical logic. In digital circuit theory, combinational logic (sometimes also referred to as time-independent logic ) is a type of digital logic which is implemented by Boolean circuits, where the output is a pure function of the present input only. This is in contrast to sequential logic, in which the output depends not only on the present input but also on the history of the input. In other words, sequential logic has memory while combinational logic does not. 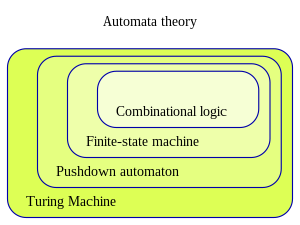 Combinational logic is used in computer circuits to perform Boolean algebra on input signals and on stored data. Practical computer circuits normally contain a mixture of combinational and sequential logic. For example, the part of an arithmetic logic unit, or ALU, that does mathematical calculations is constructed using combinational logic. Other circuits used in computers, such as half adders, full adders, half subtractors, full subtractors, multiplexers, demultiplexers, encoders and decoders are also made by using combinational logic. An alternate term is combinatorial logic, though this usage may be considered controversial. With the use of minimization (sometimes called logic optimization), a simplified logical function or circuit may be arrived upon, and the logic combinational circuit becomes smaller, and easier to analyse, use, or build. ^ Cliff Cummings. "Common Mistakes In Technical Texts". 2009. Combinational Logic & Systems Tutorial Guide by D. Belton, R. Bigwood.